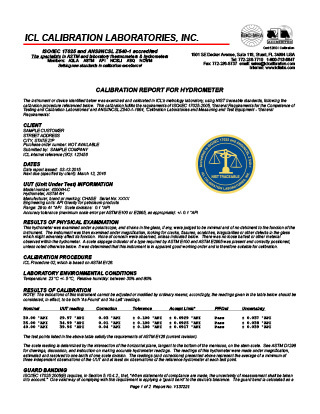 What does hydrometer calibration entail? The hydrometer is inspected visually for defects in numbering, graduating, condition, or any obvious physical defects or damage, for any loose ballast material, and the presence and correct placement of a ‘scale slippage indicator’. The instrument is then tested in carefully prepared solutions of appropriate media, against NIST calibrated reference hydrometers at the required test points (as specified by ASTM or the customer). At least three readings of the clients instrument (and at least six readings of the NIST reference standard) are taken at each test point. Readings are resolved under magnification to approximately one-tenth of the smallest scale division and are carefully noted. We report the mean of a minimum of three closely correlated readings. A calibration report is prepared detailing all pertinent information concerning the test, the observed readings of the instrument, (with corresponding corrections), and all the required information to convey NIST traceability. (See photo at right, above) All certificates are laminated in heavy plastic for protection in the laboratory environment.